Newly built (Aug 2008), premium, air conditiioned cottage that is complete with ALL the the extra's to make your stay feel pampered and luxurious. Every family needs a place to get away from it all and make memories together. La Casa Cottage Resort offers the ultimate location for a family vacation or reunion. This 3 bedroom cottage is located at the very bottom of the hill and mere steps away from the beach and boat launch. La Cantina grocery and beer and wine store provides the essentials to stock your kitchen, or take a break from cooking at our restaurant with magnificent lake views - a spectacular natural background for all your soon-to-be treasured photographs! La Casa Cottage Resort offers an escape from the everyday. Experience the beauty of the Okanagan at our lakeside resort - whether it's for a Family Vacation, Romantic Escape, Girlfriend Getaway, Weddings or Meetings and Events. There's adventure and relaxation here for everyone - hanging out at the lake, boating, swimming, kayaking, and the kids will love the aqua trampoline! We also have 2 tennis courts, mini golf, volleyball, games room, fitness centre and golf cart rental. Or hike, mountain bike and ATV in the back country wilderness behind the resort. Enjoy the unobstructed view of Lake Okanagan on the oversized private back deck. Ideally for family vacation with fantastic amenities for children of all ages and adults as well. The unit has 3 bedrooms each with hotel style queen-size beds plus a pull out sofa bed to comfortably sleep 8. 2100 ft private beach front plus a network of docks make for ample space to swim, canoe or kayak. I am pharmacist and owner of the Corner Drugstore, a community pharmacy located in the East Village Place in Calgary, Ab . I have had this business since Aug 1987. I am married to Anar Kanji, an IT Consultant with 3 kids, Nadia Valji, married with one child, Dr. Sahra Jiwani Kanji,a dentist and owner/operator of 2 dental practices in Calgary and Arif Kanji, an Insurance Consultant. I was born in Pakistan and raised in Mwanza, Tanzania. I got post secondary education, B Sc (Pharmacy) at Sunderland University in England in 1974 and worked in central London before moving to Calgary, Canada in 1997. I bought this property to get away from Calgary which has only 2 warm summer months, and because of the stunning view of the lake so as to enjoy the sun rise and sun set. The resort is 5 minutes drive from the Lake Okanagan Resort with golfing, 5 star restaurant, cafe, para sailing, horse riding, boat rentals, convenience, store etc. Wart-mart Super Store and stores are 30 minutes drive in West Banks and so are wineries. There are 12 golf courses with short distances and several picnic areas by the lake. Private balcony off the master bedroom. The resort has 2 swimming pools, 4 hot tubs, 2 tennis courts, mini golf, play ground with swings and volley ball court, a restaurant and a convenience store. Minimum Age Limit for Renters. Amenities include: 2100 ft private beach front plus a network of docks make for ample space to swim, canoe or kayak; An outdoor pool with comfy lounge chairs; Tennis courts; 18 hole Mini Golf; Playground with swings, jungle gym, slides, a sand box and more. Restaurants, games area, Business center, Fitness center, etc. Everything was perfect! Exactly as described. My only tiny complaint was that the Keurig was broken but someone left some other coffee so we were good! Quite, private and, good size deck with fantastic view of the lake. The cottage was well furnished and had all that we needed and the resort has all amenities we desired. We had great vacation at LaCasa! I am happy you had good time at LaCasa. Please do visit us again as it will be our please to host you. The cottage is nice enough and has a nice view of the lake. However, it was not very clean or maintained. There were areas of the kitchen floor that were sticky and dirt and crumbs that had gathered along the walls. Clearly had not been swept/washed. Windows VERY dirty. Carpet(s) stained, upstairs toilet wobbly, screen slide bent, stopper in one kitchen sink would not come out. Fridge freezer had spills that were not clean. Started oven and it smoked because of old spilled food. I think that some of what is charged to stay should be used for professional cleaning and some maintenance. Had 2 out of 3 light bulbs burnt out in main bath when we arrived so had to call for that and extra toilet paper as it was not stocked well. Even the landscaping had tall weeds growing in the front. Probably would not choose this cottage again for these reasons. I am extremely sorry for this and I am very disappointed as I as a guest would also expect great service than what was provided to you. As you know I am in Calgary and I rely on the cleaning company at the resort to care of our cottage. Please let me know how I can make up for these deficiencies. In terms of the cleaning company we will get a new next year. Too late for this year. I thank you for feed back as I would never known the issues. Once again I am sorry and I thank you for your business. Wonderful view in the morning, calm lake, sun rising - beautiful. Nice and clean. Fit two families of 4 quite well. Wasps are a problem on the deck if eating outside. This place was well stocked with kitchen utensils, plenty of towels. We did bring our own cleaning supplies and laundry soap etc. Great location, amenities and condo. A bit far if you want to do things in Kelowna or want to golf a lot. clean, well stocked and roomy with a great view! Being from Kelowna, we knew how far out La Casa is from the city, but It is a perfect place to stay put and enjoy the lake and the views. The home is roomy, clean and the deck is wonderful. Abdul was great to deal with and sent all the information we needed to enjoy our family get together well before our check in date. I am glad you all had great time at our cottage and thank you for your feed back! Kelowna, Thompson Okanagan, British Columbia, Canada (30 Km from Kelowna City Center, British Columbia, Canada) - There's adventure and relaxation here for everyone - hanging out at the lake, boating, swimming, kayaking, and the kids will love the aqua trampoline! We also have 2 tennis courts, mini golf, volleyball, games room, fitness center and golf cart rental. Or hike, mountain bike and ATV in the back country wilderness behind the resort. 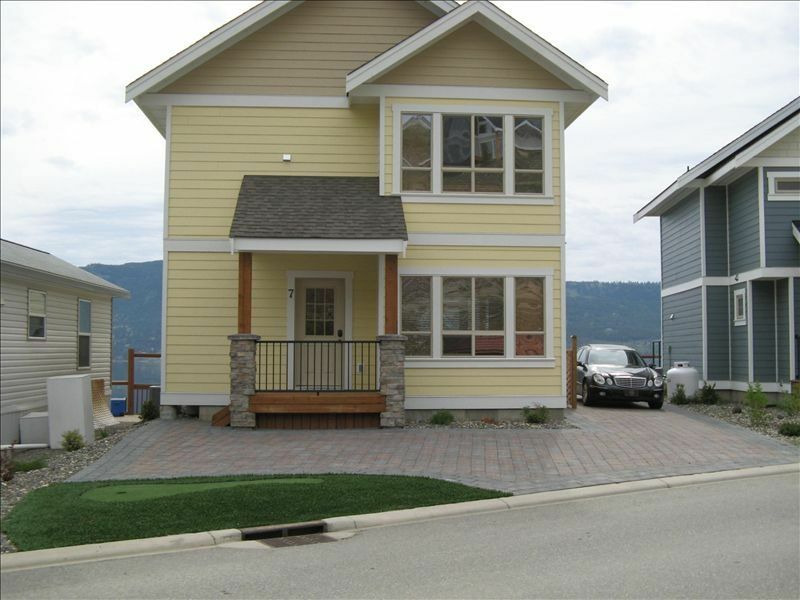 Enjoy the unobstructed view of Lake Okanagan on the over sized private back deck. Ideally for family vacation with fantastic amenities for children of all ages and adults as well.